Strokes affect more than 500,000 people in the U.S. each year. Carotid artery stenosis - narrowing of the main arteries in the neck - is a major cause of these strokes. In these situations plaque build up inside the artery, causing it to narrow. The plaque itself may have irregular edges allowing clots to form on the plaque, which can then travel to the brain, blocking smaller, but important arteries that supply blood to the brain. The result can be either a Transient Ischemic Attack (TIA), also called a "mini-stroke" or a major stroke. In a TIA the symptoms are temporary and may resolve in a few seconds, minutes or hours. In either case these are a warning sign and require medical attention. Symptoms associated with a TIA or stroke include: loss of sensation or weakness in one arm or leg, or one side of the body, but not the other; trouble with vision in one eye, like a shade coming down over the eye; drooping of one side of the face; trouble speaking or understanding speech, etc. Carotid artery narrowing may be suspected on physical exam by listening over the neck. If a bruit "noise" is heard, carotid artery narrowing may be present. Other tests that can detect carotid narrowing are ultrasound, CT scanning, MRI scanning, and angiography. 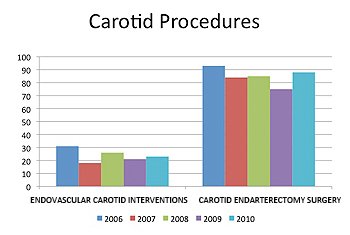 Carotid endarterectomy is a procedure which removes plaque from the artery reducing the risk of stroke. In this procedure the plaque is carefully removed from the artery. Our surgeons excel at this time-tested and durable procedure, which remains the gold standard treatment for carotid artery disease. For patients whose health or anatomic considerations prohibits open surgery, we offer carotid artery stenting with brain protection. Montefiore was among the first in the nation to perform this procedure, which patients undergo without the need for general anesthesia or incisions. A metallic stent is inserted into the narrowed carotid artery and expanded, displacing and trapping the plaque, while a filter captures any particles released, reducing the risk of stroke.